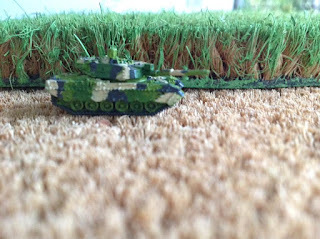 Down Under Wargames - Miniature battles in the Southern Land: We watch the lightning, crack over the *very cheaply made* cane fields and often think that this is Australia! We watch the lightning, crack over the *very cheaply made* cane fields and often think that this is Australia! 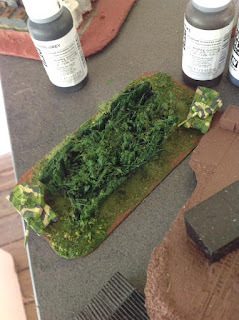 Anyway, this post is a very quick one again about some area terrain I made today. If you have seen my posts in the 6mm Facebook pages, then this info will be nothing new - but for anyone else, keep on reading! 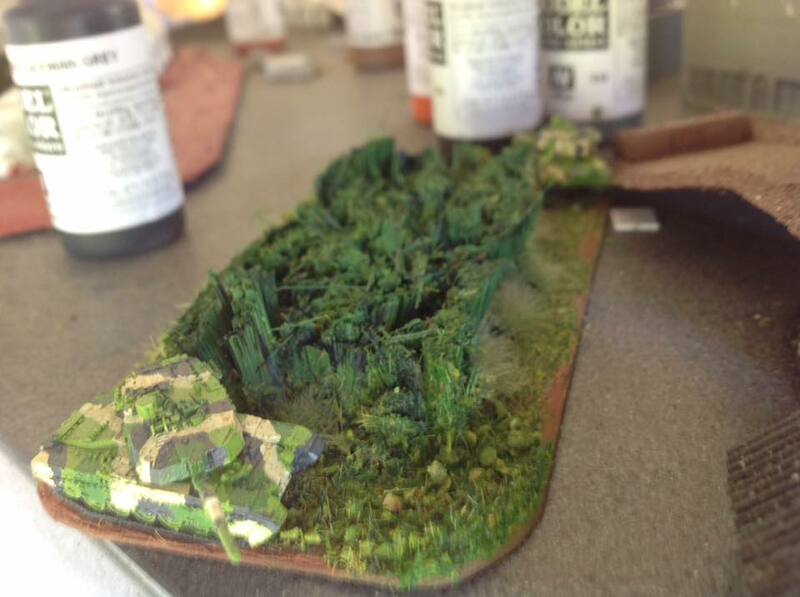 So being an Aussie on our coastline, a lot of the area up North has Sugar Cane fields... so I was hoping to make a rendition of those as area terrain for some of my battles. My first attempt was to paint the paint brush bristles in an old brush a deep green, cover them in PVC glue, let dry, then cut and glue to a base. It... well... it looks better as Elephant Grass/a slosh-pit of greenery haha! Still useful but definitely not the effect I wanted - and much too much work for the result. 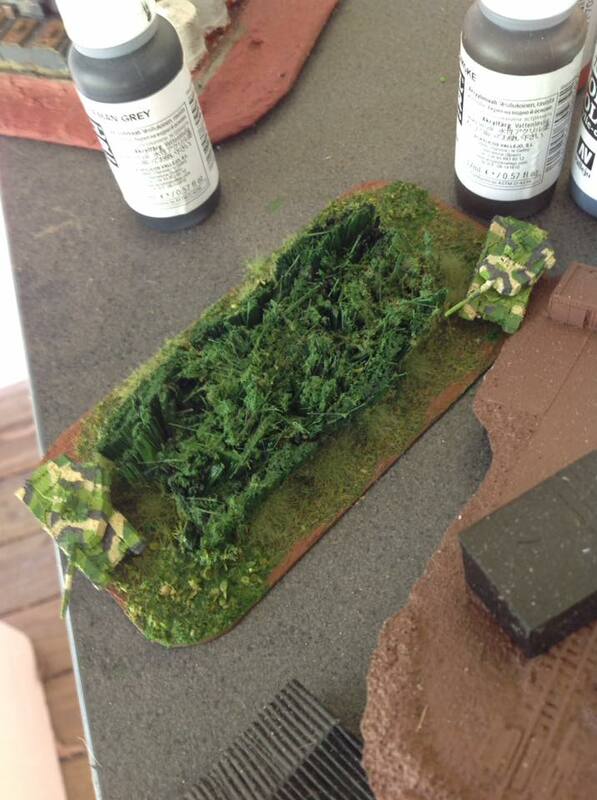 Left and above are my original attempt at long grass... "Kind of" works, but I feel I'd be better suited putting some water effects around the base and making it into a swamp! So I went to my local Bunnings store and found the perfect solution... a Coir floormat on the cheap, and a tin of green paint. Five minutes of brushing on return home, and the results match the best examples I have seen online where they make each canestalk seperately! A much, MUCH better version. Some earth coloration to the sides of the matt and it will pretty much sort itself out! You could even do the elephant grass through painting the whole lot a darker green hue than mine. Eventually I will cut out segments to act as fields, maybe even dig a few patches out and place some paintbrush bristles in there with a wrecked aircraft... maybe a downed helo perhaps??? And those canefields look pretty good, and can even compare them to the real thing in my mind as I was up around Bundaberg recently (I am in Brisbane). I am lazy and just cut up the Bunnings mats and use as is for wheatfields. Seems like the mats are a popular choice! I'm looking at something similar for my own table.